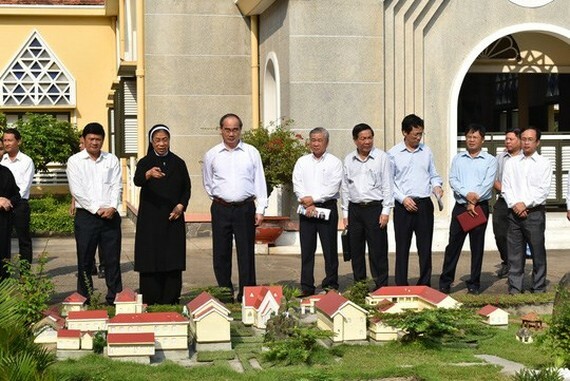 Secretary of the Ho Chi Minh City Party Committee Nguyen Thien Nhan visited the Congregation of the Holy Cross Lovers of Thu Thiem in District 2 on February 9 on the occasion of the upcoming traditional Lunar New Year (Tet). He hailed the congregation’s involvement in taking care of disadvantaged people, opening vocational training courses, and introducing jobs to locals, which contributed to ensuring the city’s effective implementation of social welfare policies. The party official hoped the congregation will promote such activities to bring better lives for needy people. While visiting the congregation’s nursing home for elderly nuns, the official wished them health and happiness. Superior of the congregation Nguyen Thi Ngoan wished local authorities a New Year of luck, health and happiness. She said the congregation will do its utmost to help the local governance reap more achievements in this year.